India is the land of proud history and the ancient temples, which are still standing strong depicting their endurance and beauty, are certainly testaments to it. Each and every state of India boasts of old buildings in the form of forts, palaces and temples. Karnataka is definitely one amongst these states which have prospered through battles and wars, development and sophistication. So, why not take a look at the oldest temples in Karnataka which showcase the detailed history of the state? Get yourself here to measure the greatness of these temples. Located at Belur in the Hassan district of Karnataka, Chennakeshava Temple is one of the prominent temples in the town on account of its historical significance and spiritual connectivity. Built under the rule of king Vishnuvardhana in 1117CE, this splendid form of architecture took an approximate time of 103 years to complete its formation. Being an important pilgrimage site in Vaishnavism, Chennakeshava Temple witnesses millions of tourists and Hindu devotees every year. The major speciality of the temple lies in its grand halls and compounds and decorated walls and pillars, which are made out of stone and exhibit an amazing work of carving. How about paying a visit to this ancient temple in Karnataka? When the talk is about ancient monuments and temples, it is impossible to not discuss the oldest ruins at Hampi. Being a UNESCO World Heritage Site, Hampi is home to innumerable historical sites dotted with temples and other buildings. Virupaksha Temple is one amongst them and is dedicated to the form of Lord Shiva. The history of this beautiful temple amidst the plains of Hampi dates back to the 7th century, during the period of the Chalukyas. Being the major pilgrimage centre, it attracts thousands of tourists and Hindu devotees every month who come to pay their respect and fathom its incredible beauty. Built alongside Tungabhadra river, Virupaksha Temple also boasts of amazing designs and patterns. Also known as Halebidu Temple, Hoysaleswara Temple was built during the 12th century around 1121 CE and depicts the Hoysala architecture. Despite being a major temple in Shaivism, certain portraits of Vaishnavism and Jainism can also be found inside the complex. Surrounded by beautiful gardens, the beauty of Hoysaleswara Temple lies in its large reliefs narrating the legends of Hinduism. If you are bored of visiting conventional temples, then Hoysaleswara Temple at Halebidu is undoubtedly your destination this season. Why not get yourself here and try to figure out the beauty and greatness of this temple? Another masterpiece of Chalukyan architecture, Durga Temple at Aihole was built during the 12th century. Even though this temple has Durga in its name, it is believed to be dedicated to either Lord Vishnu or Lord Shiva as the sculptures and images of Shiva and Vishnu found in and around the complex are almost in same numbers. 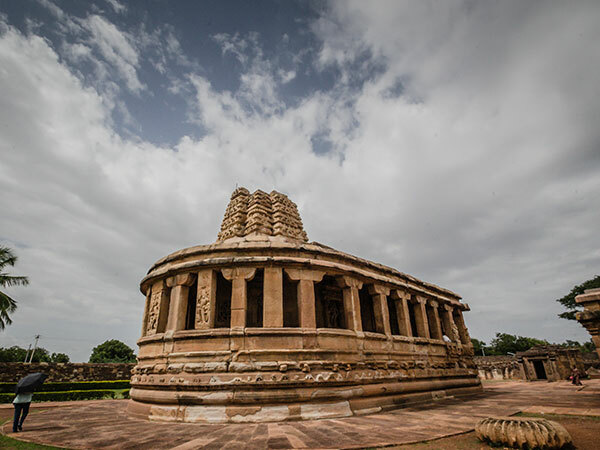 With its ceiling completely resting on several pillars, Durga Temple is one of the most beautiful pieces of monuments at Aihole and hence, attracts numerous visitors every day. How about being in the historical compound of Aihole and gazing at the beauty of its temples and ancient monuments? An example of rock-cut architecture, the cave temples are believed to be one of the oldest living temples in India and were built during the 6th century. A perfect blend of Badami and Chalukyan architecture can be seen in these temples formed out of sandstone. With six cave temples, the complex of Badami temples is one of the most visited places in Karnataka and is a hub for historians and history buffs. The portrayal of numerous designs and patterns on the walls and carved-out sculptures of certain Hindu deities enhances the existing beauty of the place. So, if you have never explored cave temples, then the cave temples at Badami is your calling this season. Settled beautifully at Lakkundi in the Gadag district of Karnataka, Brahma Jinalaya Temple is a Jain temple which was built in the 11th century under the reign of Kalyani Chalukyas. With the deity of Mahavira, Brahma Jinalaya Temple is one of the oldest temples and is a significant site for the Jains. It was built in the Chalukyan style with a shrine connected to open halls and usage of soapstone as the raw material. If you are looking to explore the history of Jainism, then the Jain temple at Lakkundi is the perfect destination for you. Today, it is flourishing under the care of Archaeological Survey of India.